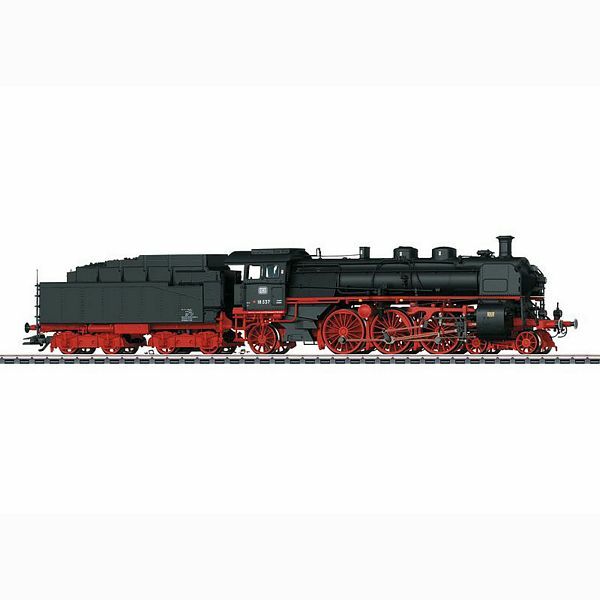 Marklin 39030 Insiders Prototype: German Federal Railroad (DB) class 18.5 express steam locomotive, with atender. With short Wagner smoke deflectors, a straight cab, German State Railroad lamps below, DB Reflex glass lamps above, and buffer warning stripes. Road number 18 537. The locomotive looks as it did around 1958/59. Model: The locomotive has the new mfx+ digital decoder and extensive sound functions. It also has controlled high-efficiency propulsion with a flywheel, mounted in the boiler. 3 axles powered. Traction tires. The locomotive and tender are constructed mostly of metal. The locomotive has a factory-installed 72270 smoke unit. The triple headlights change over with the direction of travel. They and the built-in smoke unit will work in conventional operation and can be controlled digitally. The cab lighting and the flickering light in the firebox can also be controlled in digital operation. Maintenance-free LEDs are used for the lighting. There is a close coupling with a guide mechanism between the locomotive and tender. The tender also has a close coupler with a guide mechanism and an NEM pocket. The minimum radius for operation is 360 mm / 14-3/16". Piston rod protection sleeves, brake hoses, and figures of an engineer and fireman are included. Length over the buffers 26.5 cm / 10-7/16". Cab lighting and flickering light in the firebox can also be controlled in digital operation. Figures of an engineer and fireman included. The 39030 express steam locomotive is being produced in 2015 in one-time series only for Insider members. The Class 18.5 Express Steam Locomotive In the early part of 1907, Maffei was given the contract to build a Pacific compound locomotive for the Bavarian State Railroad. Based on the Baden "IV f" built by the same builder, Maffei developed the Bavarian S 3/6, which was fated to fascinate generations of railroad fans by virtue of its timelessly elegant appearance that was chiefly characterized by the four-cylinder compound running gear. The first unit left the builder in July of 1908. Another six locomotives followed it in the same year. By 1911, Maffei delivered another 16 mostly identical units in three builder series (a to c). Departing from these first 23 locomotives, 18 units (Series d and e, Maffei 1912/1913) were equipped with driving wheels with 2,000 mm / 78-3/4" diameter instead of 1,870 mm / 73-5/8". This also caused the boiler to sit higher on these units. Starting with Series f (three units, 1913/1914) however, the builder returned to the original driving wheel diameter. By 1918, the Series i closed out this first purchasing period. With the exception of the 18 "High Steppers", the remaining 71 units all had "wind splitter" streamlined cabs. The second purchasing period began in 1923 and did not end until the State Railroad era in 1931. Maffei delivered the Series k with 30 units in 1923/24. The Series l and m followed in 1927/28 (20 units) as well as the Series n with only two units in 1930. The last 18 units of the S 3/6 as the Series o were built by Henschel in 1930/31 under license because Maffei went bankrupt. The locomotives were initially based in Munich, Nürnberg, and Ludwigshafen and they ran in heavy express train service. After World War I, 19 units had to be surrendered as reparations. On the DRG the remaining locomotives with small wheels were given the road numbers 18 401-434, 18 461-478, and 18 479-548. The units with large wheels were given the road numbers 18 441-458. In addition to the great Bavarian maintenance facilities, the locations at Wiesbaden, Darmstadt, Halle/S., and Osnabrück were also home bases for the Bavarian flagship locomotive. The most famous train assignment during the State Railroad era was surely the FFD 101/102 "Rheingold". After World War II, these locomotives migrated for the most part into ordinary passenger service. From 1953 to 1956, 30 units from the last three series were updated by the DB from the ground up. By 1962 the last of their non-modernized siblings were in storage. Only road number 18 505 remained in operation at the BZA Minden as an experimental locomotive until May of 1967. Today it can be admired at the DGEG Railroad Museum in Neustadt/Weinstrasse. A passenger car set to go with this locomotive is also available exclusively for Insider members under item number 42259. This model can be found in a DC version in the Trix H0 assortment under item number 22880 exclusively for Trix Club members.